Mardi Gras Socks! What a great way to show your true colors: PURPLE, GREEN & GOLD! Also great as favors or gifts. 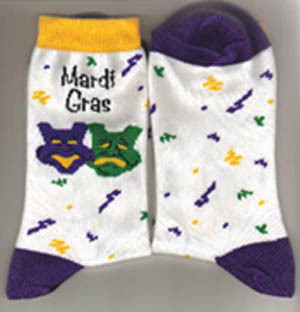 These socks feature a Mardi Gras Jester faces and the words "Happy Mardi Gras" across the bottom of the sock. Sizes available: 5-6, 7-8, 9-11. These high quality socks are made in the USA of 75% cotton, 15% nylon and 10% spandex.